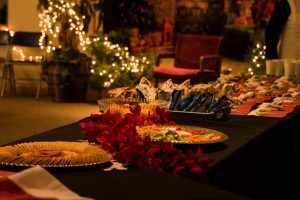 On December 4th, 2018 the Walla Walla Valley Disability Network and Parent to Parent held its Annual Holiday Party honoring those in the community whom have made a difference to someone with a disability. Gavin Osegueda works for Blue Mountain Industries as an Employment Specialist, where he assists individuals with disabilities find employment in the local community. Gavin was Nominated by Jeanne McMenemy for the “Make A Difference Award” for his work in Advocacy, where he has displayed commitment to advocating for individuals with disabilities and/or special needs. 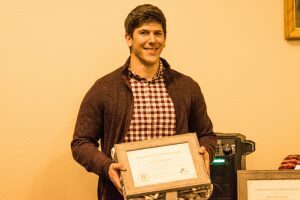 Gavin was honored for speaking up on issues important to him and our local community, all while working to make a difference for individuals with disabilities. Gavin was awarded with a certificate of appreciation and a special gift from the Walla Walla Disability Network. 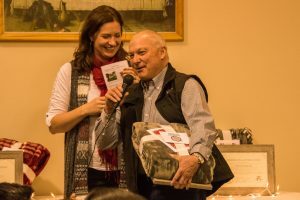 Another Nominee, Ron Klicker, whom owns the Klicker Store in Walla Walla, was honored and awarded for Inclusion, where he has shown unmatched initiative to be involved in activities that promote inclusion and friendship in the community for individuals with disabilities. Gavin and Ron have worked together to foster a relationship that brings awareness, promotes inclusion, and opens the doors for possibilities for individuals with disabilities. Thank you to Ron Klicker, and congratulations Gavin Osegueda!